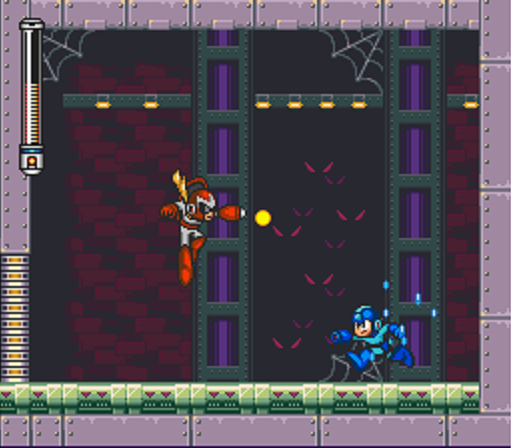 When Mega Man 6 was released on the NES, Mega Man X was already available on the SNES. Sure, it was only a difference of two months, but, as we discussed last time, the classic Mega Man series already felt quaint by comparison. If there was a compelling reason for it to continue alongside its new baby brother, Mega Man 6 didn’t seem to know what it was. And so we had a gap. For the first time since the first sequel, more than one year passed without a new release in the classic Mega Man series. At the time, it probably felt like Mega Man was dead, with Mega Man X taking its place. It was probably a surprise, therefore, when Mega Man 7 another, unexpected classic series entry was released on the SNES, the home of its own successor. I say “was probably a surprise” because I sure as heck didn’t know it existed. As much as I loved the series, and as much as I was still following video games, my attention was elsewhere. Mega Man 7 came and went without even making its presence known, much less piquing my interest. If Mega Man 6 felt a bit late to the game because Mega Man X was already on shelves, Mega Man 7 must have felt downright ancient; by the time it came out the SNES already had Mega Man X2 and Mega Man X3. (If there was one tradition Capcom wanted to keep alive, it was series fatigue.) To ask us to take up arms against Dr. Wily again after three games in which we were fighting Sigma was to ask us to regress. To grow backward. To become, again, something we’ve already moved on from being. It’s safe to say that Mega Man 7 failed in whatever halfhearted overture it might have been making to departed fans. I don’t doubt that people played it. I don’t doubt that some of them liked it. But I do doubt — conclusively so — that it made any kind of widespread impact the way earlier Mega Man games did, or the way Mega Man X games were making now. Mega Man 7 was orphaned before it was even born. But I think that’s rather sad. 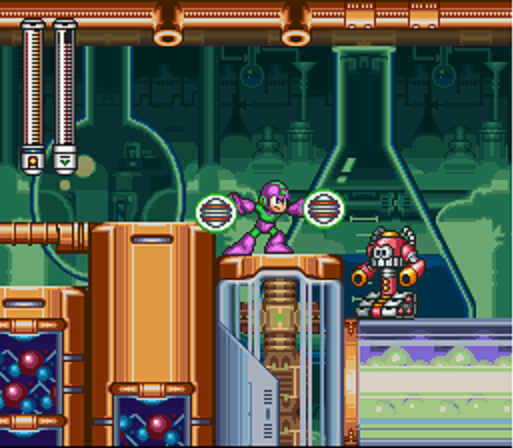 Mega Man 7 is far from perfect, but I actually think it does a great job of evolving the classic formula for new hardware, it’s positively gorgeous to look at, and it’s one of the most fun games in the series. In fact, it’s one of my favorites. There’s a charm to Mega Man 7 that doesn’t exist in many games. There’s the sense that, whatever it’s doing, it’s having fun…a sense that was entirely absent from the previous game. There’s the sense that it knows it’s a relic and that there’s nothing it can do to catch up, so it might as well enjoy itself. Mega Man 7, I’m sure, was greenlit because it might as well have been. It was a relatively low investment of finances and resources to crank out a game with a proven formula. If it flopped, it wouldn’t flop terribly, and if it soared Capcom would be able to milk two series concurrently on the same system. The risk was low, and the bet was safe. I’m sure of that. And so I’m under no misapprehension that Mega Man 7 was a labor of love, or even a game the developers especially believed in. It was another installment, making its begrudging transition to the next console generation. It was a decision born entirely of commercial greed, and not at all of artistic integrity. And yet, the result was still pretty great, and one deserving of more celebration than I’ve ever actually seen it get. 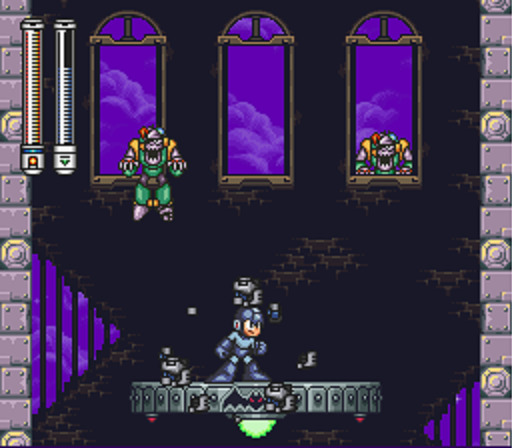 The story is nothing unique, aside from an unexpectedly tight bit of continuity at the beginning: the newspaper reporting Wily’s arrest at the end of Mega Man 6 is shown here in a 16-bit upgrade, and his next batch of slumbering Robot Masters busts him out of prison. I don’t know if it was the X series’ stronger focus on narrative that inspired the developers to suddenly care about anything that happened before, but it’s a pretty nice and unexpected touch to see a deliberate bridge between the events of these two games. Beyond that, though: eight Robot Masters, new special weapons, fortress stages, refights, Wily. The story is everything we expected, and nothing more. In fact, it could be argued that it’s a bit less. The absence of a pre-Wily fortress leaves no room for the false-villain feint we’ve now come to expect. There’s no attempt to convince us that Dr. Cossack, Proto Man, or Mr. X is behind this mess; it’s Wily from the start, for the first time since Mega Man 2. Is that a step backward, or a welcome return to simplicity? It’s hard to say, but since only one of these false-villain twists was interesting or any good (hello, Mega Man 4) I’d say we’re not losing much by cutting out the fluff. Okay, yes, I know, nobody plays Mega Man for the story, so what I should really be taking into account is less the fact that we’re spared a false villain and more the fact that we’re losing an entire fortress worth of stages. But, here’s the thing: I’m a quality over quantity kind of guy every time. I’d rather have a shorter game that’s tightly designed and rewarding to play than one that pads itself meaninglessly. Ideally, yes, we’d have a longer game that’s just as good or better than the shorter one, but we all know that a) that’s not the rule and b) Mega Man specifically struggles with that. 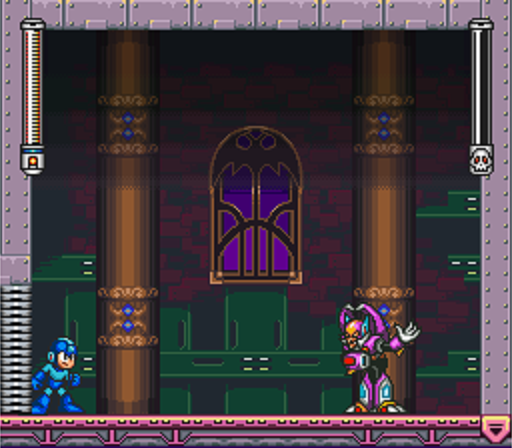 The “extra” stages between the Robot Masters and Dr. Wily’s fortress were never really all that great. A grand total of once (again, hey, good job, Mega Man 4!) were they fun to play, and the rest of the time they ranged from forgettable (Mega Man 5) to atrociously designed (Mega Man 3). 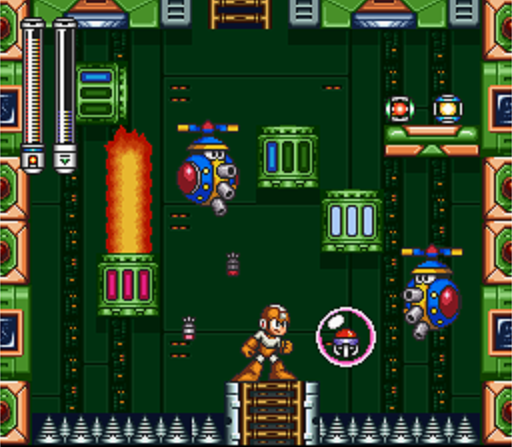 And I’m not a fan of the fortress stages anyway; the more of them you have, the more the game’s balance shifts away from what should be its main attraction: the new Robot Masters. For those reasons, I’m not just okay with losing an unwelcome batch of fortress stages; I encourage it. In theory. Because what I’d really hope for in exchange is a better batch of the fortress stages we do get. Ones that can be a little better honed and designed and refined because we just took a good chunk of levels off the designers’ plates. And Mega Man 7 does not have very good fortress stages. But we’ll come back to that. 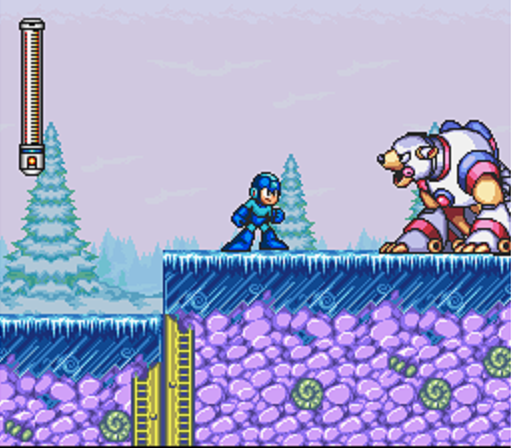 What really won me over about Mega Man 7 is the way it looks. In fact, the SNES is my favorite console from a visual standpoint. It offered a richer palette than the NES, leading to greater vibrancy and detail, as well as more expressive animations, but it was also still technically limited. Photorealism was so far out of its grasp that relatively few games tried to look realistic at all…which, happily, meant that video game artists actually had to develop an artistic direction. Nowadays there are still, of course, visually striking games, but there’s no denying the fact that many of them, particularly those with larger budgets, just try to make things look real and move on. And that’s not art. That’s not style. That’s not creativity. Realism has its place and it has its merit, but it’s not interesting. When an artist instead chooses to create an entire visual universe, it gives the game more personality. More of an identity. And more, in my eyes, appeal. When I think about the SNES (or the Super Nintendo, as we always knew it), I think first about the sharp, bright colors that brought familiar worlds and characters to life in such a new and unforgettable way. I loved Mario, but never in my wildest dreams could I have expected the visual feast that was Super Mario World. I loved Link, but how on Earth do you go back to The Legend of Zelda after seeing Hyrule in A Link to the Past? I loved Punch-Out! !, but Super Punch-Out!! made the cartoon boxers feel alive. Turtles in Time, Super Metroid, Super Castlevania IV…the list goes on, and I’m just naming series that found new life after moving on from the NES. Open it up to SNES originals and, of course, the list gets even longer. SNES games were beautiful. Video games had never looked better, and, to this day, I think they’ve only rarely looked better. There’s little as appealing (or nostalgic) to me as the animated comic strips that were SNES games. And while I didn’t play Mega Man 7 at the peak of my love for the system, I sure appreciate it today. As a result, the game is full of wonderful, charming flourishes. There are obvious ones, like the opening gag with Mega Man putting on the wrong helmet (emphasized by the boss select tune, which audibly gives up). But there are so many smaller things that are easy to overlook, too. There’s the way the walking-eye enemies reach the end of a platform and extend a leg just beyond where you think they should stop, feeling for solid ground. There’s Treble, Bass’ dog, growling at you at the end of the intro stage. There’s the Game Boy you can have Rush dig up at the beginning of Junk Man’s lair. There’s the way Freeze Man will stand still as long as necessary, taunting you to make the first move. There’s the way Shade Man bows to show his respect. There’s the way you can hit Spring Man with the Thunder Bolt to turn him into a powerful electromagnet. There’s just so much love here. So many unnecessary little details and moments that lend the game an air of specific significance, and make it feel like more than the seventh entry in a series that’s overstayed its welcome. The move to 16-bit hardware, though, was bound to bring with it a visual upgrade. So, yes, as much as I truly adore the way Mega Man 7 looks, I have to admit that that was kind of a given. What impresses me is that the series — admittedly dragging its feet through the past couple of games — didn’t allow the new coat of paint to be the primary selling point. The visual refresh must have triggered a surge of developmental creativity as well, because Mega Man 7 is the most innovative game in the series since Mega Man 3 in terms of how much new it does. Whether or not you like the things Mega Man 7 brings to the table is down to personal preference, but there’s no denying that it did innovate, and that its innovations stuck around. 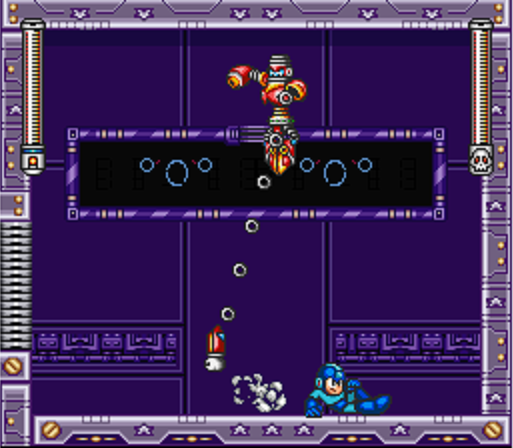 We listed most of this game’s innovations in the last installment (Bass, Auto, two sets of four Robot Masters, intro and midpoint stages, screws as currency, shop) but what’s really interesting is that a number of these stuck around right through the NES style rebirth games Mega Man 9 and Mega Man 10. Those, as you’ll remember, hit a deliberate reset to restore the series to its simple, accessible roots, most notably stripping Mega Man of his slide and chargeable Buster. And yet the screws, shop, Bass, and Auto all remained part of the formula as so much else was taken away. In fact, in terms of game mechanics, the shop is Mega Man 7‘s most lasting impression on the series, and it’s an important one. I honestly don’t think many players would have beaten Mega Man 9 without it. 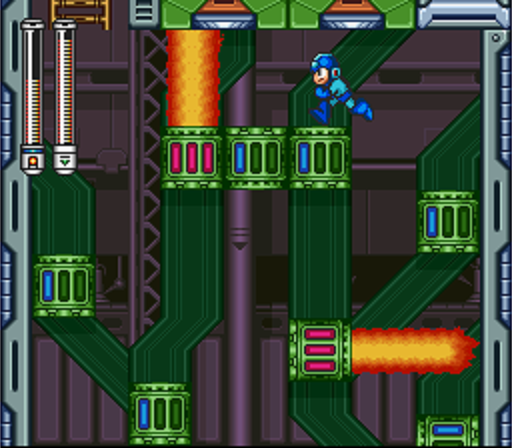 On the whole, Mega Man controls as tightly here as ever. It sometimes feels to me as though he’s moving more slowly, but that might be an illusion caused by the additional frames of animation, all of which are gorgeous and smooth, and the tradeoff for which — if, indeed, there’s any tradeoff at all — is very much worth it. 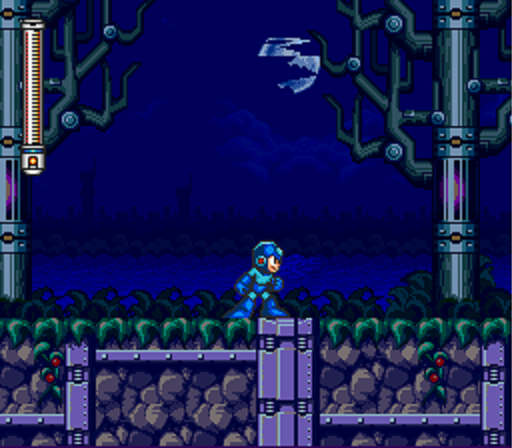 One common complaint I’ve heard is about Mega Man’s increased sprite size, but that’s something I’ve never been able to understand. People speak about this change as though the levels and enemy placements aren’t designed around his larger size, but they clearly are, as any given screenshot will illustrate. Sure, he takes up more space than he did in his NES days, but that’s not inherently a bad thing. It’s only bad if the levels are packed as full of obstacles, baddies, and projectiles as they used to be. Which they clearly are not. 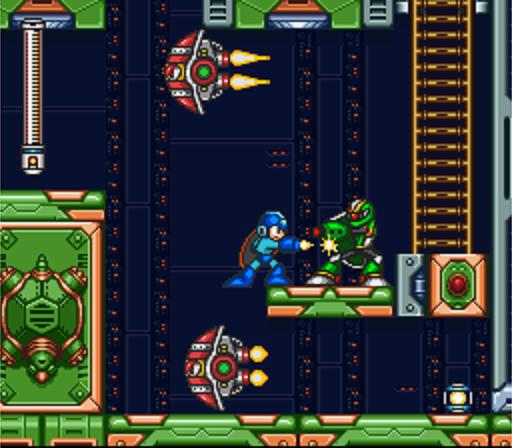 Instead, the enemy placement in Mega Man 7 feels more considered and deliberate. 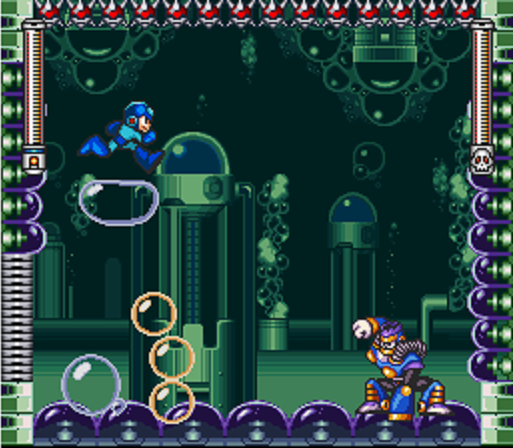 While previous games would throw waves of enemies at you — sometimes respawning ones — and attempt to catch you off guard with quick intrustions from off screen, Mega Man 7 usually gives you just one or two to deal with at a time. Rarely do they come in waves, and when they do, they’re part of a well-considered setpiece. (See the elevator rides in the Junk Man and Shade Man stages, or the flatbed miniboss in Turbo Man’s.) In short, as much as I love the earlier games, they sometimes tossed you into hectic situations for the sake of causing carelessness through panic. That’s not a complaint; that’s part of their design. But, here, the philosophy is much different: a smaller number of enemies, used to a more considered effect. No longer does the game want to overwhelm you; it wants to outwit out. And Mega Man’s increased sprite size facilitates that. It makes the levels feel less empty than they actually are, because you see less of the screen at once. All you really need to be aware of is Mega Man himself and the most immediate hazard. The design of the game allows that, and I honestly believe that if you disagree, you’re not engaging with the game properly. If you really feel as though there’s too little room to accomplish what you need to accomplish, you’re trying to accomplish it the wrong way. The larger sprites enhance this experience, making it feel more like a genuine clash between powerhouses than two sets of pixels shooting at each other. The Robot Masters here aren’t the best in the series — which is a shame, because I really wish they were — but the fights with each of them feel significant in a way that they rarely did in the previous games. 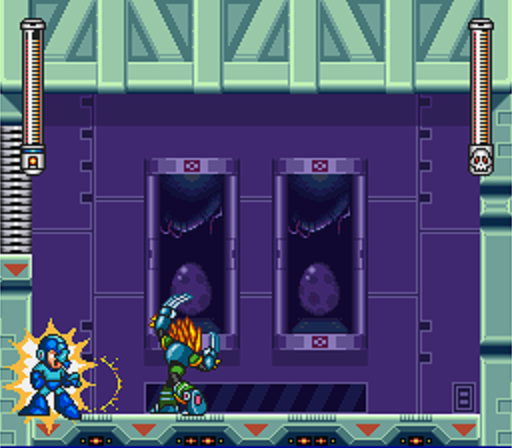 As a bigger sprite you are a bigger target, but that goes for your enemy as well, and no Robot Master in Mega Man 7 feels unfairly quick or difficult to avoid. The closest violation would be Slash Man, but even he isn’t anywhere near as unfair as Quick Man or Shadow Man from the previous games. I won’t lie; I’m terrible against Slash Man. But I’m also aware that most of the damage I take is down to my own poor (or slow) choices. He rains pods of adhesive down upon you, and if one connects, you’ll find your mobility compromised, giving him a clearer shot at you. But you can nearly always dodge these pods if you’re quick enough, which keeps you on a fairly even footing with him. The rest of the time, you can just jump, shoot, and react to him as you would any other boss. Quick Man and Shadow Man, by contrast, begin their assaults the moment you walk through the boss doors and don’t ever let up. Slash Man is also one of the few Robot Masters here that isn’t absolutely crippled by his weakness. And, overall, that’s one of Mega Man 7‘s problems. In previous games, weaknesses were handled pretty well. Fighting a boss with the Buster was some degree of difficult, and fighting them with their weakness reduced that degree*, but usually not by much. They’d still put up a fight, and you couldn’t afford to get totally careless. All the weakness would do is deal a bit more damage than usual. Mega Man 7, though, pushes it too far. Instead of an option between a normal fight and a slightly easier one, you get the option between a normal fight and no fight at all. 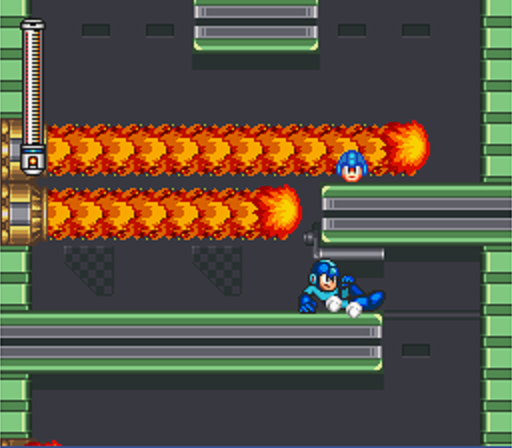 The Robot Masters are so overcome by their weaknesses that they become immobilized, trapped in an easily exploitable pattern, or both. In short, once you know a Robot Master’s weakness, you can afford to get totally careless. At least, usually. There are two exceptions, which is a relief. One of them, again, is Slash Man, who is probably the best handling of a weakness in this game. Not only is he often out of range of the Freeze Cracker, but if you hit him with it he’ll slide around on the ground, and can cause contact damage that way. This is nice, because it adds a small element of alternate risk to the fight. Yes, you can use his weakness, but if you do you’ll have to deal with an additional obstacle. The other exception is Freeze Man, who is necessarily risky to fight with his weakness as it’s a shield weapon. ** Hitting him with the Junk Shield briefly locks him in place, but it also leaves you with very little room to avoid colliding with him. 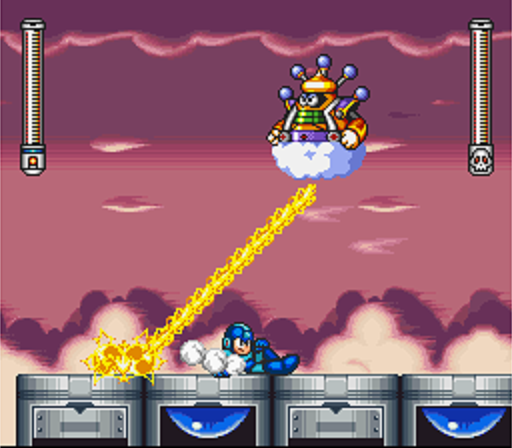 This is a blessing in disguise, though, as this encourages you to use the Buster against him, and Freeze Man is legitimately one of the most satisfying Robot Masters to fight that way. At first, he seems to be a bit more frantic than fair, and his ability to freeze you to the spot and knock on you helplessly makes him feel like a frustrating bully. But if you spend a few rounds focusing not on attacking but on responding, you’ll learn how he moves. You’ll learn that his attacks come in a predictable cycle. You’ll learn that he jumps high enough when you fire at him that you can slide harmlessly underneath. You’ll learn, in other words, that this is a dance, and you have to let him lead. Once you learn the proper way to deal with each of his actions, it’s an extraordinarily graceful fight, and one of the highlights of the entire series for me. It’s surprisingly beautiful in motion, and it’s clear that the programmers spent a lot of time honing the choreography of that fight into something complex and layered. The developers also seem to have had their creative juices refreshed when it came to the stages. 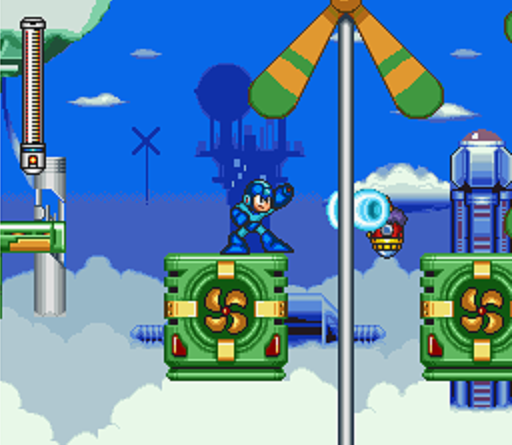 Granted, you had relatively standard air (Cloud Man) and ice (Freeze Man) stages, and we have an upgraded version of the junkyard we saw back in Mega Man 4 (Junk Man), but those each have their unique quirks and the remaining stages are like nothing we’ve seen before. Turbo Man’s stage is a fire-tinged car factory. 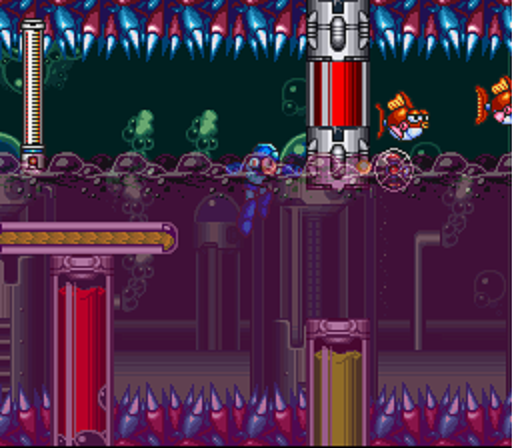 Burst Man’s stage imbues its color-coded water sections with two entirely different sets of physics. Then we get to the really good stuff. 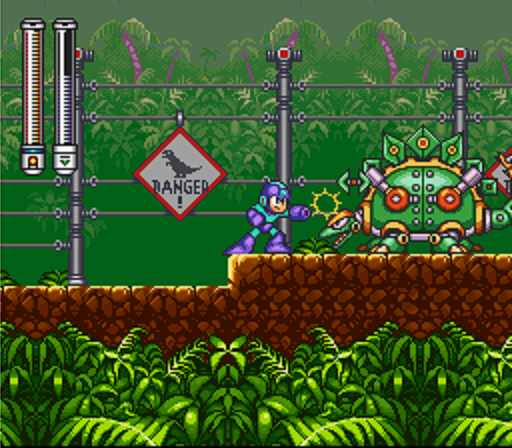 Slash Man’s level is a stage-long tribute to Jurassic Park, a movie that was released two years before the game and loomed very large in the cultural consciousness of the time. It’s crawling with robot dinosaurs, which is cute in itself, and you journey from the electrified perimeter fence all the way to the hatchery and lab at the park’s (presumed) center. 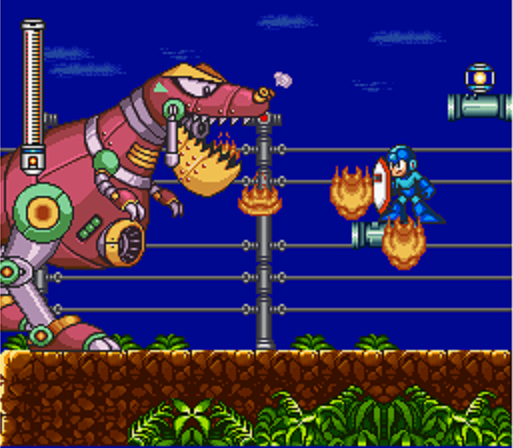 We haven’t gotten a dinosaur-themed or movie-themed level since, and that makes Slash Man’s stand out. Then there’s Spring Man’s stage, my favorite in the game, with its incredibly bouncy and sprightly theme to underscore an incredibly bouncy and sprightly level. The stage is toy-themed, which is something else we hadn’t seen before. (Though Top Man may come close.) 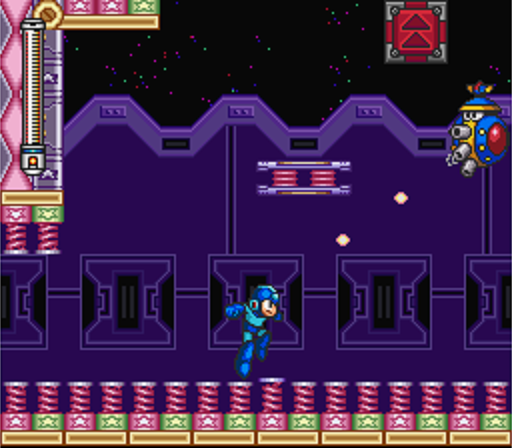 Much of the challenge here comes from keeping control of Mega Man, who is sent reeling by springs in the walls, ceilings, and floors, as well as teaching yourself the ins and outs of each new platform type. (Almost as though you’re getting to play with some new toys of your own, hm?) It also contains a surprisingly wide-open room at about its midpoint which scrolls in all directions and offers multiple paths from the entrance to the exit. It’s a nice bit of non-linearity in a series that has never quite embraced the concept, and it makes Spring Man’s stage feel all the more fun for it. It is, quite literally, a playground. But where the Robot Masters fall down, the special weapons pick up. In fact, I’d venture to argue that this was the best batch of weapons in the series so far. Of our new toys, only one really feels disappointing: the Scorch Wheel. It’s sluggish to fire, awkward to aim, and not especially powerful. It’s pretty lousy, and never worth using outside of the one area in Slash Man’s stage that lets you burn some foliage to find Beat. I think it says a lot that Dr. Wily’s final form is usually weak to the most cumbersome weapon in the game, but Mega Man 7 knew that asking you to hit him with the Scorch Wheel was unconscionable. The Wild Coil is also pretty crap. It fires two springs at once — one before you and one behind you — and you can vary their bounce height. There’s not much to it and it’s not especially useful, but it works well enough against Shade Man, as you can just launch one as he swoops in to grab you. It’s a good defense that doubles as offense. Then there a couple of pretty good weapons. The Freeze Cracker is a large projectile that splits into shards when it hits a surface. It can also be aimed slightly up or down, which sounds more useful than it actually is. It’s essentially a slower, larger version of the Shotgun Ice from Mega Man X, but it’s still a decent weapon here. 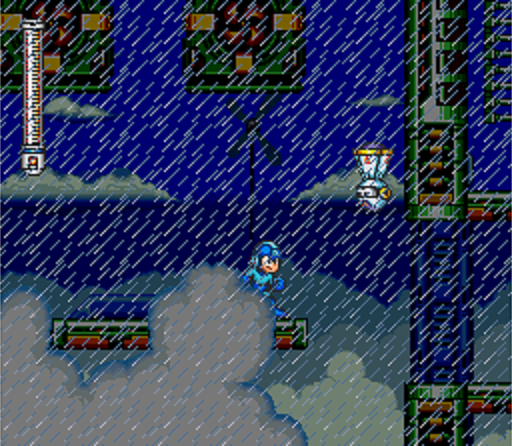 It also freezes cloud platforms, freezes lava, and allows you to trigger a snowstorm in Cloud Man’s stage. The Danger Wrap is an explosive encased in a bubble, which can absorb enemies and allow you to shove them into other enemies, which makes it pretty fun to play with. You can also encase otherwise invincible enemies and knock them harmlessly out of your way, and you can drop the explosive without a bubble by pressing Down as you launch it. It has a lot of use. Then we get to the great stuff. The Noise Crush is a sonic weapon that bounces off of walls, allowing you to absorb it and fire it back even stronger. You can’t power the projectile up more than once, and the necessity of having a wall available means it’s not always the best option, but it’s a lot of fun to play with and a great weapon once you’re used to using it. You can also fire it and quickly slide into it to avoid having to rebound it back into yourself, but that’s more of a novelty than any real boon to its usefulness. Great weapon, though, and one of the most fun to experiment with. Next there’s the Junk Shield, the single best shield weapon in the entire series. Of course, “best shield weapon” just means it’s extremely durable, so I’d be lying if I said it was exciting. But it is nice to finally get a shield worth pulling out. The Thunder Bolt is a powerful electric attack that splits into two projectiles and travels up and down when it hits something. 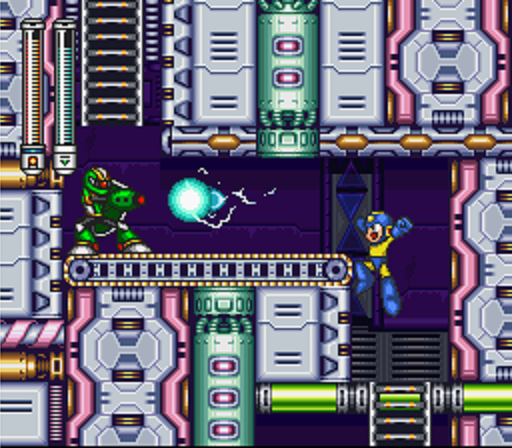 It’s another Mega Man X echo, being very similar to the Electric Spark from that game. Here it can also be used to energize machinery, trigger thunderstorms and lightning, and unintentionally power up two bosses. It’s a really great weapon, but it’s still not my favorite. The Slash Claw is very satisfying to use, and it actually encourages you to play the game a bit differently. It’s extremely powerful, but it requires you to get within arm’s reach of dangerous enemies. Do you trade away distance for power and showmanship? Hell yes I do, and while it predates any substantial role for Wily’s masterpiece, playing Mega Man 7 with the Slash Claw reminds me of playing some of the Mega Man X games as Zero. Sure, you can pick off enemies from a distance…or you can get right up in their face and slash them to bits. There’s a reason Zero is such a popular character, and it’s the exact same reason the Slash Claw feels so good to keep equipped. Its only downside is that we can’t get it until we’re halfway through the game. In addition to being perhaps the best overall batch of weapons, these are also the most versatile. Nearly all of them allow you to fine tune the attack in some way and serve as a utility. To refer to Mega Man 9 pressing the reset button again, it’s worth noting that the weapons were more in line with what we see in Mega Man 7 than with what we’ve seen in any previous game. Mega Man 9‘s weapons also pulled double duty, functioning as tools just as you see here. They don’t just make fighting easier; they make traversing levels easier. Another welcome change is the fact that the boss weaknesses feel logical again. Perhaps this is helped along a bit by the additional frames of animation, which make it more clear why a Robot Master is reacting to your weapon the way he is. Additionally, though, you can reason them through fairly easily. Cloud Man is weak to the Danger Wrap because it floats up and encases him, bringing him crashing to the ground. Junk Man’s exposed wiring short circuits when he’s hit with the Thunder Bolt. Slash Man freezes solid when hit with the Freeze Cracker, like a Cro-Magnon man waiting to be thawed and studied. That resonates thematically with his stage, which is brilliant. The weapons also lend themselves to minor environmental puzzles, none of which are mandatory and few of which, admittedly, are satisfying to figure out. But it encourages experimentation in a way that previous games in the series did not; there, you’d just try to figure out which weapon worked best against which enemy. Here it’s up to you to determine which objects and obstacles can be interacted with, as well as the tool that will allow you to do it. Of course, the game isn’t perfect. And I can identify more true flaws in it than I can in most games that I love. For instance, there’s the Robot Museum mid-stage, which was clearly abandoned at some early point in its development. The evidence there comes from its lovely music, which mashes up songs from previous Mega Man games and doesn’t nearly get the chance to play fully before you make it to the boss. It’s a song composed for a decent stretch of level, but what we actually get is just a few empty rooms. 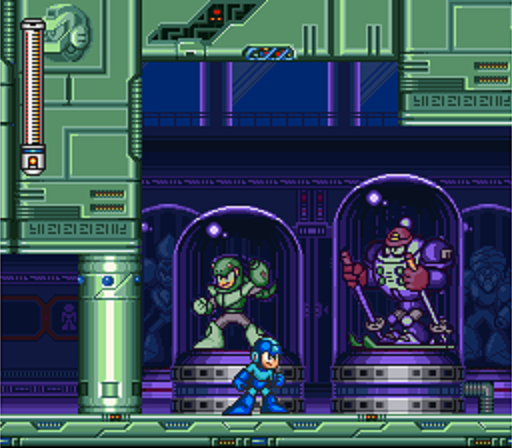 The concept of revisiting past Mega Man experiences in museum environment is a solid and interesting one, but evidently the team didn’t have time to make good on it here. The concept would be revisited to far greater effect in Mega Man & Bass. Oh, and, hey, speaking of Bass…Bass is introduced in this game! He’s a genuinely great character, and one I’m glad has remained with the series since. However, he’s symptomatic, I think, of another problem. After all, he’s a recurring foil for Mega Man, popping up a handful of times to fight him and hold him back from Dr. Wily. He’s an ethically murky character with allegiance that seems to shift throughout his appearances. He serves as a test of what you’ve learned, and a gate you’ll have to pass several times in order to complete your mission. That’s right; Bass has taken on the Proto Man role. Which is a shame, because Proto Man was a rich and intriguing character. After Mega Man 3, however, the series didn’t know what to do with him. In Mega Man 4 and Mega Man 5 he was almost entirely off camera and the player never interacted with him. In Mega Man 6 and some of the Game Boy games he was relegated to Eddie’s role, dropping off an item and beaming out into irrelevance. In this game he’ll drop in to give you some hints. It’s strange, and while there is an optional Proto Man fight in this game, I’m sad that they had to introduce an entirely different character to fulfill what was largely the role he originally occupied. In other words, I like Bass but I sure wish we didn’t need him. 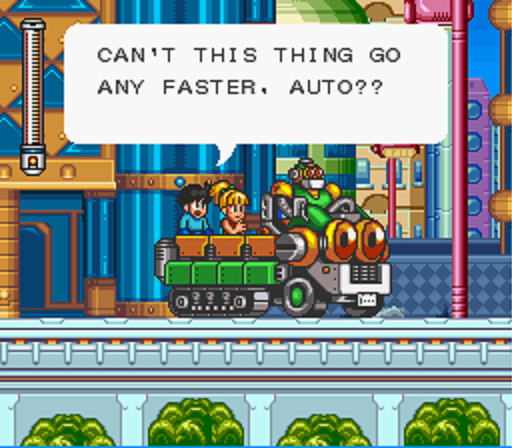 Another odd choice is the dialogue section that follows each Robot Master fight. Mega Man and Dr. Light chitchat for a bit about whatever weapon you just got, and that’s nice. 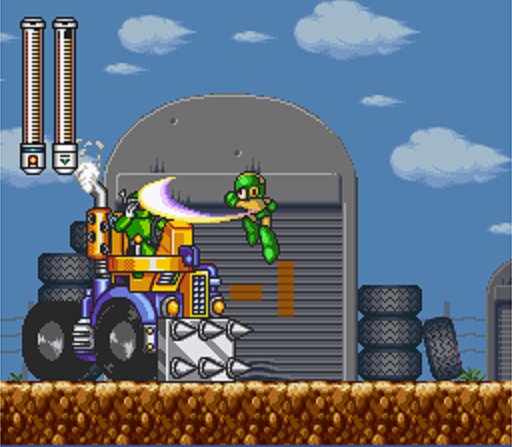 I prefer weapon demonstrations to weapon narrations, but since the demonstrations in Mega Man 6 were utterly worthless, I can’t blame them for trying something different. The problem is that the conversations omit fairly important information. For instance, they doesn’t mention that the Freeze Cracker can be aimed, that the Danger Wrap can be fired without its bubble, or that the Junk Shield can be launched at will. That may have been purposeful, leaving a bit of room for experimentation and discovery on the part of the player, but in that case I think it would have been better to go with no explanation at all. 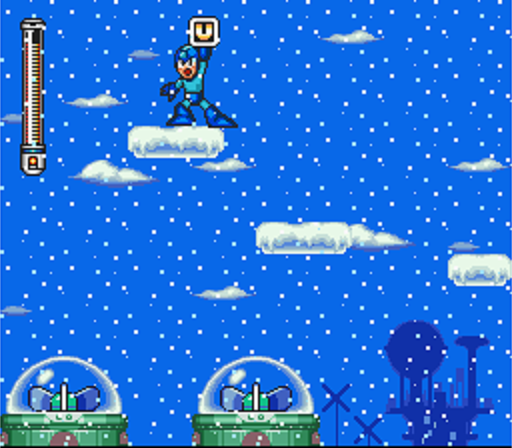 When we do get explanation, we assume that’s it; if Dr. Light says that the Freeze Cracker shatters when it hits a wall, we assume that that’s all it does. Why wouldn’t we? He would have said more if it did more, so we don’t experiment with pressing Up and Down while we fire it. On the other hand, had Dr. Light said nothing at all and left us to figure it out, we may well have. I think the solution Mega Man 7 came up with actually hinders rather than encourages that experimentation. Also, I’ve heard that the Japanese version has dialogue between Auto and Roll, during which they make jokes about the weapons. I’m a bit surprised that was excised from the Western release, as it would have fit quite well with the cartoony approach of the game and the elevated presence both of those characters have here. It’s a shame we missed out on that. I’m also not a fan of splitting the Robot Masters into two sets of four. In addition to forcing me to cobble together a decent stage select image for the start of this article (look forward to that tradition vanishing next time…), it makes guessing weaknesses so much easier. In, say, Mega Man 2, you’d defeat one Robot Master and get a new weapon. Your odds of blindly choosing the Robot Master who is weak to that weapon is 1:7. In Mega Man 7, you’re more than twice as likely; the odds are 1:3. That’s a huge difference, and it’s even more stark when you have two weapons. Mega Man 2 could keep you guessing for hours. Mega Man 7 reduces the fun of correctly identifying your next target, and I’m not sure that the four-and-four arrangement offers any benefits of its own to negate that. Of course, it could offer a benefit of its own: the fact that the developers can design levels in the second set that hinge on items the player will have acquired in the first set. That would have been a nice twist but, alas, they don’t do it here. That’s one of very few areas in which Mega Man 8 actually improves upon its predecessor, as the stages of Sword Man and Search Man are designed exactly that way. And then there are the fortress stages, which feel like an enormous step down from the Robot Master stages in terms of fun. I know I don’t speak much about fortress stages and Dr. Wily fights in these reviews, but that’s because there’s usually very little to say. 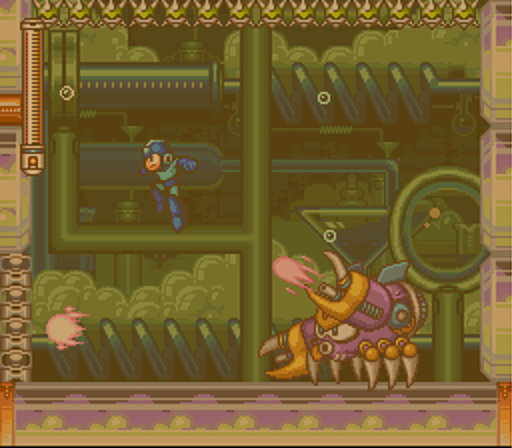 They’re gauntlets, the bosses are enormous, and Wily is a cheap punk. 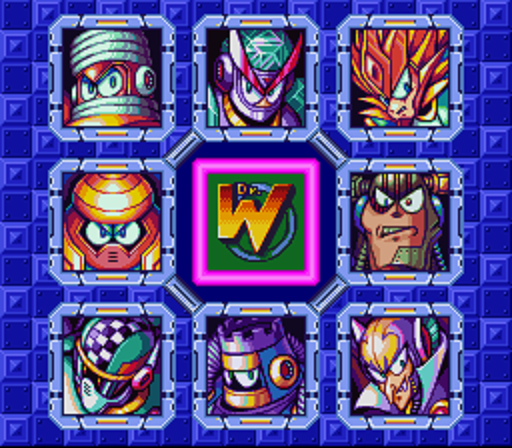 Here they’re even less fun than usual, especially since Dr. Wily’s final form is extremely powerful and very difficult to avoid. It’s a rare Mega Man fight that’s truly designed terribly, and the only way a reasonable player will complete it is by draining E-Tank after E-Tank. You’ll eventually succeed, sure, but you’ll never feel like you’ve earned it. Still, though, for all the bad I can say about it, I love Mega Man 7. Anything negative you’ll read above is the result of nitpicking. On the whole, it’s one of the best of the series, and one of the best games in the incredible SNES library. It gets strangely overlooked, and I’m not sure why. It’s clearly of a piece with the rest of the classic series, and yet its visual novelty alone helps it stand apart. It’s an experience worth having in its own right, in all of its colorful, bouncy, addictive glory. Mega Man 7 doesn’t quite offer a compelling argument for this series and Mega Man X to exist in parallel. In fact, if anything, it reminds us which series is less inventive, which series is more at home in the past than the future, which series the fans have already moved on from. But I’m still glad it exists. And I’m glad I took the time to engage with it. 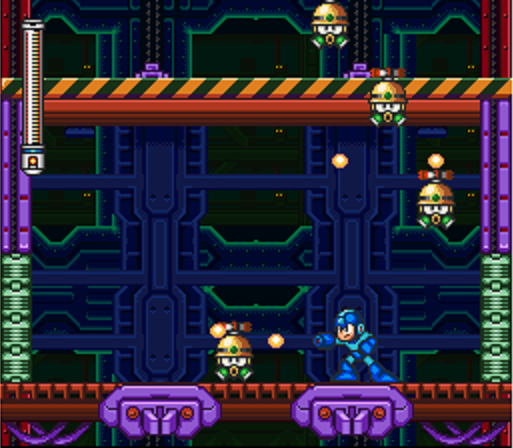 And I really, really wish we had two games in this style, rather than two in the style of Mega Man 8. Speaking of which…well, tune in next time. * At least, in theory. I actually think many Robot Masters are easier to fight with the Buster than with their weaknesses. From the games we’ve covered so far alone: Cut Man, Guts Man, Fire Man, Metal Man, Crash Man, Heat Man, Top Man, Toad Man, Ring Man, Dive Man, Wave Man, Stone Man, Tomahawk Man, and Freeze Man. ** Granted, you can fire the Junk Shield, but only at angles that are difficult to predict. I don’t know that I’ve ever successfully hit him that way. I meant to ask if you thought this game was a successor to the “World” series on Game Boy as much as it was to the console series. This did combine the rocketpack with the rocket fist, after all… The four-and-four boss pattern started because they were sampling robots from two NES titles each, so it seemed natural to make you get through one game’s worth before taking on the four stages based on the next game. Here, I don’t know what the idea is behind giving preferential treatment to some new robots over other new robots. The larger sprites also make it feel like a game on a smaller screen! The shop system started in the fourth Game Boy game, where it was just Dr. Light asking you to collect the nondescript “P-Chips” to provide you some refill items, and it was fun to save up random drops again for more than a bigger score like the first NES game. It seems like a good idea to have a new character to fill that role specifically, but then why did that change the role already in 8? I think it’s funny to mention a Saturday morning cartoon aesthetic when you consider how the actual MegaMan cartoon of the time handled it. 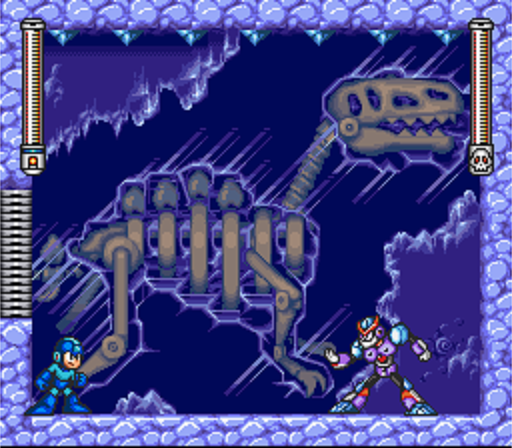 They actually had episodes about a robot dinosaur park and a mansion of classic horror monsters as robots, but this game really shows up their bland American designs and baffling “Oh no, MegaMan is devolving! How does this even work? !” crises for plot. 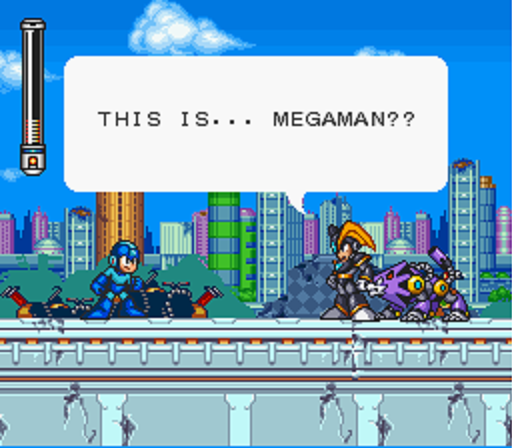 It’s especially funny that Bass is introduced to become Dr. Wily’s permanent right-hand man when the cartoon already turned ProtoMan into that, and I think I actually prefer Scott McNeil’s mocking tones over the angry anti-hero Bass had to be to explain his becoming a playable character fighting the same forces as MegaMan. Your comments are always a great mix of things I meant to say but couldn’t find a place to, and things I probably should have said. Looking forward to your take on Mega Man 8! Honestly, I hadn’t considered 7 to be a successor to the Game Boy games, but you make a good argument for that. (Well, several good arguments.) My bad on not remembering that the shop system (among other things!) was introduced in a Game Boy game before this. I can’t believe it took me this long to remember that this was the game that nerfed the charged Mega Buster to only double the power of an uncharged shot, whereas most other MegaMan games triple it. I can only guess that was intended to further encourage the use of special weapons, but it may only serve to make battles long and frustrating again when a weak-point weapon just isn’t available!